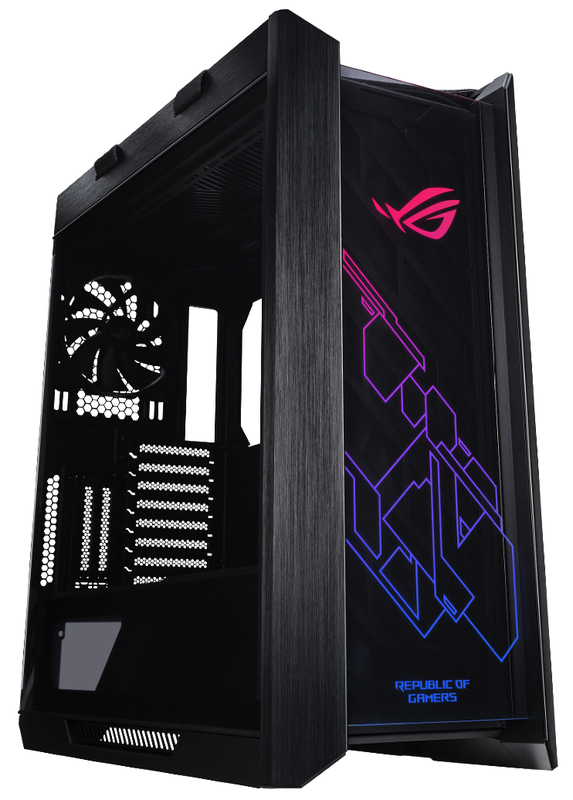 Fremont, California (April 12, 2019) — ASUS Republic of Gamers (ROG) today announced ROG Strix Helios, the first gaming PC case from ROG. Strix Helios is a premium mid-tower chassis with superior aesthetics, a comprehensive cable-management system and ample room for water-cooling setups. Designed from the ground up to accommodate ROG components, Strix Helios is sure to make the short list for any ROG enthusiast. Strix Helios has been thoughtfully designed with flexible covers and a comprehensive cable-management system to keep the interior tidy, clean and sharp. An adjustable multifunction cover with GPU braces cleverly hides cabling, provides sturdy support to graphics cards and allows for an SSD or ROG Aura Terminal to be mounted for display. There's also a two-piece PSU shroud with a front cut-out to enable compatibility with ROG Thor or other OLED-integrated power supplies. In the back, a translucent cable cover conceals unsightly wiring while allowing illuminations from RGB devices to shine through. Building with and maintaining a Strix Helios is also made simple. Release buttons at the rear of the chassis allows builders to swing down the side panels for instant, tool-less access to the interior. The panels are bottom-hinged, and will remain supported at an angle until they're ready to be completely detached. The case also comes with fan and radiator mounts, and removable filters on the top, front and underside for all-round dust protection. The ASUS ROG Strix Helios is immediately available at a MSRP of $279.99 from Newegg and soon available at other leading retailers. Please contact your local ASUS representative for further information. ASUS is one of Fortune magazine's World's Most Admired Companies, and is dedicated to creating products for today and tomorrow's smart life. Our comprehensive portfolio includes Zenbo, ZenFone, ZenBook and a range of IT devices and components, along with AR, VR and IoT. ASUS employs more than 16,000 people worldwide and over 5,000 world-class R&D talents. Driven by innovation and committed to quality, the company won 4,511 awards and earned approximately US$13 billion of revenue in 2017.